BANGI, 2 Oct 2012 –The Chancellor of The National University of Malaysia (UKM) Tuanku Muhriz Ibni Almarhum Tuanku Munawir wants commercialisation of research findings at the university be promoted as it can nurture a culture that encourages exploitation of intellectual assets of the university for wealth creation. This will contribute to the sustainable development and growth of the country’s economy while also benefiting the university and its researchers, he said. Tuanku Muhriz who is also the Yang dipertuan Besar of Negeri Sembilan said that in efforts to commercialise its research findings there was also a need for the university to select the appropriate commercialisation model for technology transfer. He was opening the third Tuanku Jaafar Law Conference and Workshop on Academic Entrepreneurship and University Start-upshere today. It was organised by the Faculty of Law, the Centre for Entrepreneurship and SMEs Development (UKM-CESMED and theCentre for Collaborative Innovation (PIK) and UKM Institute of West Asian Studies (IKRAB), UKM Technology Sdn. Bhd and the Companies Commission of Malaysia (CCM). It was attended by some 160 law practisioners, government officers, academicians and law students and the private sector from Indonesia, China, Iran, Britain, Uganda, Hong Kong and Singapore. 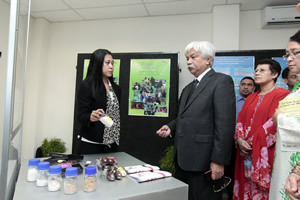 He said UKM being one of the top research universities in the country and given its capability was already promoting entrepreneurial activities while actively commercialising its research findings. It was thus fitting that issues pertaining to such activities be discussed including whether a research university should give emphasis to curiosity-driven fundamental research or to a user-driven shorter term development of applied research. Other issues that needed to be discussed include how to attract greater private sector funding and the extent the private sector can be encouraged to finance some of the research and their commercialisation. Issues over the extent a research university needed to undertake to accomodate that new third mission as an addition to its primary role of provididng education and bringing about intellectual discovery also needed deliberations. He said the challenges he brought up are what leaders of Malaysian universities needed to face when nuturing entrepreneurship in their campusses. At UKM which had already provided some incentives to support the academic entrepreneusrship culture, it still needed to know the extent and progress of that transformation initiatives including a look at the success of its start-up programme, he said. This would include the question of incentives for research, availability of funding and strategic infrastructures for innovations and how well its star scientist and angel investors programme had helped the academic entrepreneurship transformation initiatives. The way forward for UKM was to lead the way in resolving those issues so that it could be an example to other universities, he said. 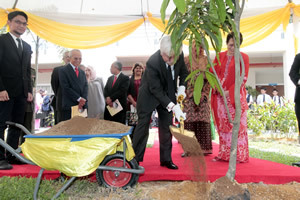 Tuanku Muhriz later opened the new Moot court of the Faculty and saw a ‘trial’ in session at the court.